Pic tures from New Year's Eve Party. I spent this past New Year's Eve at Nancy's. She is a good friend from CMCNY. I was supposed to go last year but ended up changing my mind. I am so glad I made it there this year. 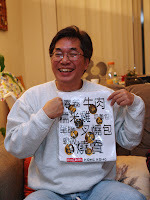 It was packed with food and other good friends from CMCNY. I know it is almost February and people are asking me why it took so long to get the pictures up? Well, I pretty much tweaked every pictures slightly and it took a bit of time. I guess once you know what you can do to make a picture better you are going to try to fix it up. I met Alan and his family for the first time. They have two boys and one girl - I am sure they keep Alan and his wife busy. All the kids were very cute and pudgy (if there is such a word). Henry advising Charlie on his camera-buying options. Charlie did buy a camera that night. Guess how much he spent? Henry's lovely wife, Sharon and their son, Nathan. Alex, another photographer in CMCNY. Francis posing with his birthday present. Can anyone guess whose legs are these? Anyway, here are the rest of pictures. I was in Los Angeles for a week - it was half for fun and other half for work. We flew in on Friday and stayed at Victor's new apartment for two nights. It is a very nice apartment. Both the host and hostess (what? who?) are curteous and thoughtful. 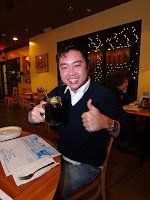 The first night we had some really really awesome Chinese food at 大上海 - the 豆酥鱈魚, 絞白筍炒肉絲, 蟹黃絲瓜 were simply excellent. Unfortunately, I was too hungry to take any pictures. Victor and Anita checking out the Chinese recipe brought over by Tami. 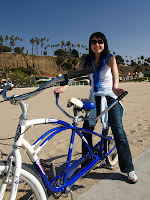 The next day, we went down to the Santa Monica beach for bike riding. It was only our second time on tandem bike. It was great, except for the old rental bike that was problematic - flat tire, stuck brakes, etc. We saw the Arlington West at Santa Monica. 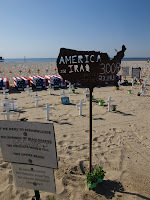 This is a temporary memorial set up in memory of American soldiers who have fallen in Iraq. It was quite a sight. More info on the temporary memorial here. 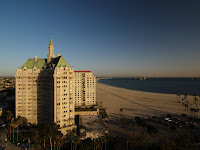 The entire set of pictures from my Califonia trip are up. Here they are. There were plenty of sun and on the day we headed into Orange County, it hit mid 80s on the thermometer. Even the breeze was warm. One of the practice I was interviewing at set us with relocating service and a real estate agent to see some of the properties around LA. It was quite an interesting experience. I snapped this shot on the balcony of one of the high rise building I was seeing. 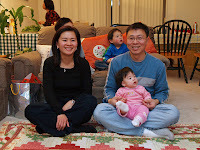 During our stay at OC, we met up with Tami's cousin, Mei and Peter. They were very nice and took Tami out when I was away for interviews. Their kid, Mathew and Elizabeth has grown quite a bit since I last saw them. I met up with my friend, Dave, too. He has been out in LA for about 3 years now. He seems to enjoy it. We (Victor, Anita, Tami, Me, Dave) went to the LA Kings vs. San Jose Sharks at Staples Center. I was really tired from the interview and was dozing off half way through the game. We finished the night off with some food from Monterey Park. I guess I was kind of busy during the Christmas/New Year period and did not get a chance to write much on my blog. I hope everyone had great time with his/her family and received lots of gifts. I had a great 2006. I did a total of ~25 hikes, bought a bike and more camera gear (2 new bodies and 1 new lens). I also picked up biking as a new hobby, although I still haven't gotten used to a sore hinnie yet. Job is also going well. I finished my residency and started my pediatric anesthesia fellowship. So far there hasn't been too many mishaps (thanks to Dr. Sun and Dr. Kazim). Finally, I turned 30. I guess it is a big deal for some. The only thing that I had wished for is seeing my family who did not make it to NYC this year. All in all, it was a good year.